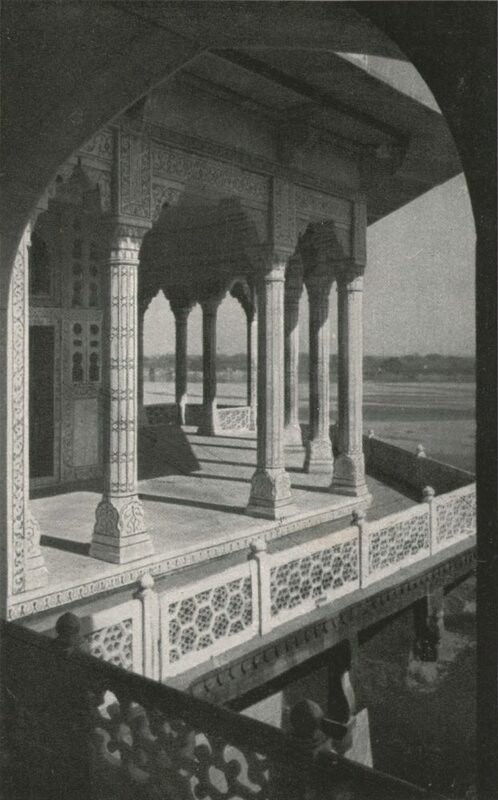 The “Dewan Khas” or “Private Hall of Audience” is situated at one end of a broad stone terrace overlooking the river. At the other, alas! is a vacant space; on it formerly stood a corresponding pavilion, which, according to tradition, was constructed of green marble, if there be such a substance; at all events, of some rare material. It had shared the fare of the Zenana of Akbar; it had become dilapidated; it was pulled down. The “Dewan Khas” is of white marble, a large open room, whose flat roof is supported by a double row of slender twelve-sided columns. Musamman Burj was built by Shah Jahan for his beloved wife Mumtaz Mahal. It is said that at first a small marble palace built by Akbar was situated at this site, which was later demolished by Jehangir to erect new buildings. Shah Jahan in his turn chose this site to erect the multi-storied marble tower inlaid with precious stones for Mumtaz Mahal. It was built between 1631–40 and offers exotic views of the famous Taj Mahal….It is here that Shah Jahan along with his favorite daughter Jahanara Begum had spent his last few years as a captive of his son Aurangzeb. He lay here on his death bed while gazing at the Taj Mahal in Agra.